Prime Minister Sheikh Hasina on Thursday expressed her government's firm stance to remove the warehouses of inflammable materials from Old Dhaka and other residential areas of the capital. "Such inflammable materials can't be allowed to be here. We're looking for a separate place for them (businessmen). But we don't want to ruin their businesses. But no chemical warehouse can be allowed in residential areas," she said referring to the recent Chawkbazar fire incident that killed 71 people. 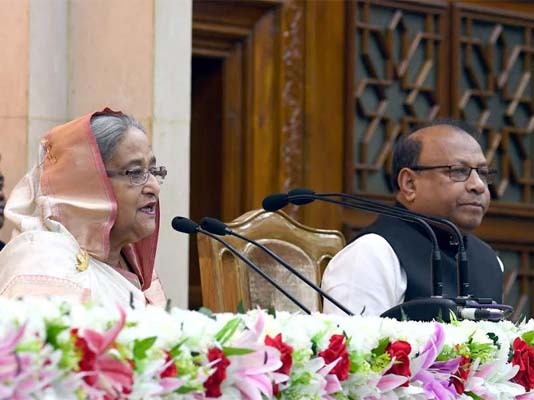 The prime minister said this while addressing the oath-taking programme of the newly elected mayor of Dhaka North City Corporation and 50 newly elected councillors of DNCC and Dhaka South City Corporation at the Prime Minister's Office in the city. Pointing at DSCC Mayor Sayeed Khokon, who was present at the programme, Sheikh Hasina said the recent fire incident in Old Dhaka is very painful. She said, "The businessmen (of inflammable products) can keep their showrooms and sell their products here. But we'll arrange a completely separate place for warehouse where inflammable materials would be safe." Mentioning the Nimtoli fire incident that took place in 2010, the prime minister said many people lost their lives in the two fire incidents in Chawkbazar and Nimtoli areas. "So, we won't accept any obstacle in this regard," she warned.